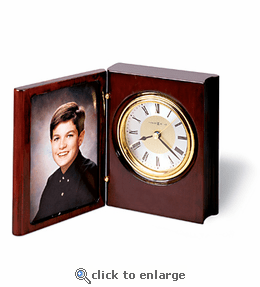 Book clock with folding front cover opens to display a photograph or engraved brass plate (not included). Waterfall bezel in polished goldtone finish accents a brushed brass-finished dial with a diamond-cut silvertone ring featuring black Roman numerals. Finished in Rosewood Hall on select hardwoods and veneers. Quartz movement includes the battery. As a special offer, we will add up to three lines of engraving at no additional charge. Engraveable items require extended production time. Approximately 5.25"x4.5"x2". Expertly crafted by Howard Miller.